On Tuesday night, renowned underwater photographer Brian Skerry presented a jaw-dropping multimedia journey through the oceans of the world in Ocean Soul, a National Geographic Live! event. He led the audience from the glacial waters of the arctic, to the “deserts” of the open sea, to the predator infested waters of tropical coastlines. Skerry’s photography and impassioned storytelling also brought viewers face to face with the drama between humanity and the wild seas. His images of wildlife trapped like flies in fishing nets hauntingly echo the urgency of his mission; to save the ocean. 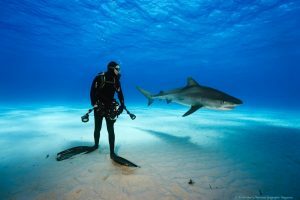 While exploring multiple facets of marine life, Skerry focused in particular on the plight of sharks, an often vilified and misunderstood species. In his photography, Skerry aimed to portray sharks in their true nature. They are wild predators, to be sure, but also a beautiful, intrinsic part of the ocean’s ecosystem. Brought to the edge of destruction by human activity and negligence, sharks’ only hope of survival today are the efforts of conservationists. The fate of elegant makos, curious tiger sharks and the legendary great whites falls into our hands. Throughout his travels, Skerry faced both heartbreak and hope. He admitted that what lies before us is no small task: it will take millions of small steps to save an ocean dying “from a million cuts” we’ve inflicted. But despite it all, Skerry has hope for the future. We know the problem, we know the solution… now, we have to act.